Nokia's N-Series range of high-end smartphones had been making waves for a year by the spring of 2006, with several interesting devices coming to market. April 2006 saw the launch of the unusual N93 clamshell phone, launched alongside the forgettable N72 and popular N73. The main selling point of the N93 was the camera module, installed in the hinge (as found on the N92 and N90 phones). This 3.2 megapixel unit had Carl Zeiss optics, could capture VGA resolution video at 30 frames per second and most unusually for a phone it has a 3X optical zoom. Presumably all of this made the N93's camera quite bulky, hence it was hidden in the hinge with a twistable screen to make it usable. The Nokia N93 was a Symbian device, making it a smartphone.. although the 2.4" 240 x 320 pixel display wasn't a touchscreen. 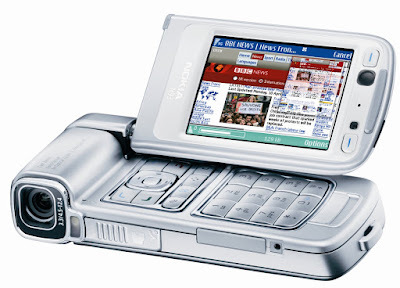 It supported both 3G and WiFi connectivity, could output directly to a TV, came with expandable memory, Bluetooth, a multimedia player and even had an FM radio. It was a well-specified but chunky device, coming in at 180 grams and over an inch (28mm) thick when closed. It was expensive too, priced at €550 before tax and subsidy. Despite the apparent desirability of the N93, it was only a moderate sales success. Eight months later a slimmed down version was produced, the N93i.. but THAT device was announced just one day before the original iPhone which ended up getting all the attention. Because it is such an unusual device, both the N93 and N93i tend to be relatively expensive these days, with prices ranging between €50 to over €600 depending on condition. A good unlocked example of either model can cost around €200.